The notorious Captain Mattie St. Armand hijacked a white Englishman from a brothel onto her ship. She dresses as a man and often disguises her appearance; one of the many things she does is smuggle freed slaves from Florida to the Bahamas. Having a white man to pose as the Captain can definitely add another layer of protection. Oliver Woodruff had only wanted to travel a bit before settling down to work at the family mill but found him settling into life on the ship better than he expected. He's fascinated by Mattie, and more than willing to put action to his words condemning the American slave trade. Both are hesitant to do anything more about their mutual attraction because of society's rules. 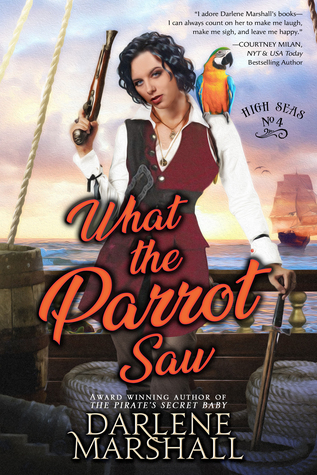 Though What the Parrot Saw is book four in the High Seas series and I hadn't read the prior ones, I didn't feel as though I was missing anything when the book began. It easily reads as a stand-alone, though it could be that there are minor players in this novel that appeared in earlier ones. We open right away in the brothel where Mattie is convinced to take Oliver, and we don't find out for certain about Mattie's gender for several chapters. Oliver is definitely more open-minded than most men would be in this situation, especially with the way there's discussion of Mattie using him sexually and the implication that Mattie and the madam have had a sexual relationship in the past as well. Her sexuality, like her gender, is simply accepted as whatever-it-is-at-the-moment, which we often don't even see in modern times. These are explicitly clarified as the novel goes on, and Oliver continues to accept that these are facets of Mattie and hold no bearing on the relationship he wants to build with her, which is exceedingly mature of him. There is a lot of action in this book, both of the sword and pistol variety as well as the bedroom variety. At the heart of the action in the middle and later stages of the novel is helping slaves escape, and the description of their treatment and the attitudes of the white slave owners in that period in Florida is not minimized in any way. This gives some context for the conflicts and struggles that they have because it's a question of class, race, lifestyle, and legal issues. None of the concerns are treated lightly, and even the inevitable happily ever after ending has to be negotiated. It's in a way believable and a little authorial maneuvering, but it fits the romance and relationship very well. Enter our current giveaway sponsored by JORD Watch.